Harriet Rigg was born in 1863Q1 in Stepney, London, UK [St George in the East, Vol: 1c, Page: 723] and died in 1941 [1941Q2 Essex S.W. Vol: 4a, Page: 202]. Charles Byford (1896?-1962) who married Lilian Mumford. 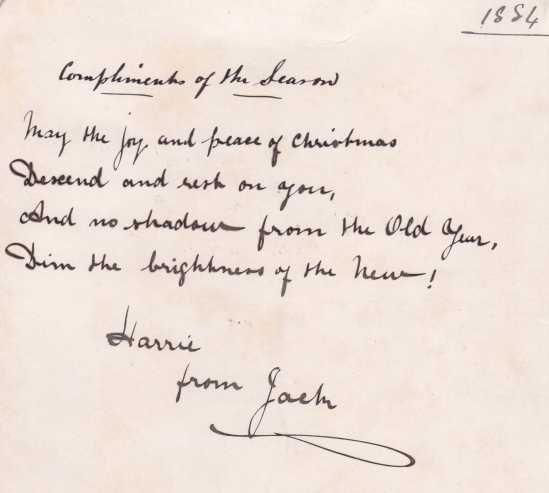 Most of the older pictures in my possession come from the photograph album started by Harriet in 1884 (see the dedication below) and eventually given me by my "cousin" Winifred before she died. Many of the pictures in the album are unidentified and some were sent from family connections (unknown to me) in Melbourne, Australia. The picture shown here is of her nursing a baby (Charles?) 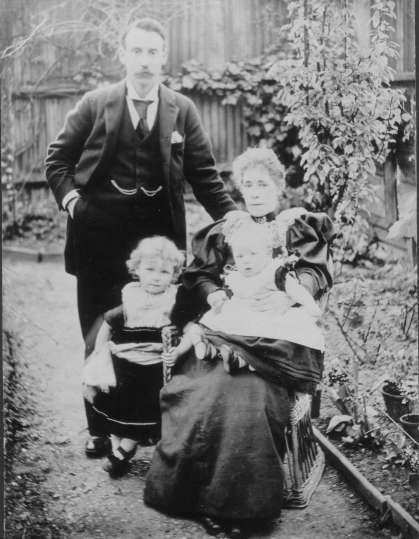 and with daughter May standing in front of her father Jack at their home in Wanstead, UK. Jack was a successful businessman importing fine silks and Meissen porcelain. In early married life, they lived in Mornington Road, Leytonstone E11 but moved to Wanstead in Dangan Road towards the end of the 1890s, and very soon after that to 1 Spratt Hall Road, Wanstead. May became a respected Christian medium and Winifred married the Rev'd Rex Eastment when she was in her forties and already an established author. In the 1911 census no record has yet been found - surpringly!! Her parents were James Rigg (1816-1887) who was recorded at the birth as a "Tailor" and Catherine McDonald (1827-1899). Harriet Rigg was my grandfather's aunt.